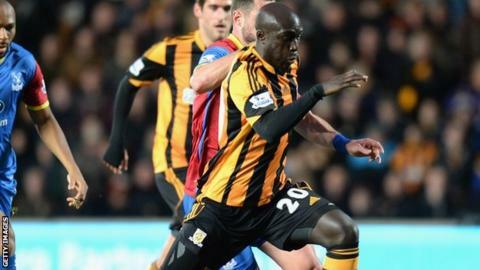 Hull will "vigorously defend" striker Yannick Sagbo after he was charged with improper conduct for social media posts relating to the 'quenelle' gesture. Sagbo, 25, posted a picture on twitter of Nicolas Anelka making the gesture - linked with anti-semitism - alongside the word "legend". A ban could rule him out of the FA Cup semi-final against Sheffield United. "We'll defend him vigorously because we don't think Yannick has tried to offend anybody," said Hull boss Steve Bruce. Hull, who have until Tuesday to respond to the FA charge, said they will seek a personal hearing. Bruce added: "We could lose him, and especially with semi-finals and finals coming up and Shane Long and Nikica Jelavic not available, then of course it would be a big blow to us." French-born Cameroon international Benoit Assou-Ekotto, 30, who is on loan at QPR from Tottenham, has been charged with the same offence as Sagbo. Anelka was banned for five games and fined £80,000 for making the sign after scoring against West Ham in December, and was sacked by West Brom. The striker claimed he made the gesture, described as an inverted Nazi salute, in support of his friend Dieudonne M'bala M'bala, a French comedian who has been convicted seven times of anti-Semitic crimes.